No. 30: CBS will use 70 cameras to capture the game on television. Here are 50 things to know about Super Bowl 50 before the Carolina Panthers and Denver Broncos face off on Sunday. 1. Super Bowl 50 marks the second Super Bowl played in the Bay Area. Super Bowl XIX was played in Palo Alto, where the San Francisco 49ers defeated the Miami Dolphins 38–16. In total, there have been 11 Super Bowls played in California. 2. If Cam Newton wins the Super Bowl, he will become just the 11th Heisman winner to play on a Super Bowl champion team. 3. The Broncos won the first game ever played in Levi's Stadium when they beat the San Francisco 49ers 34–0 on Aug. 18, 2014 in a preseason contest. The Panthers have never played a game at Levi's Stadium. 4. Levi’s Stadium installed a brand new field just for Super Bowl 50. 5. However, that did not come without some difficulties, as grounds crew members initially painted “Broncos” in the wrong end zone. 6. The Carolina Panthers' last Super Bowl appearance came on February 1, 2004, when they lost to the New England Patriots 32–29. Denver most recently played in Super Bowl XLVIII on February 2, 2014, losing to the Seattle Seahawks 43–8. 7. Super Bowl 50 will be just the fifth game ever between the franchises. Here is a look back on their previous matchups. 8. Carolina is one of 13 NFL franchises to have never won the Vince Lombardi trophy. 9. The Broncos are tied with the Patriots, Steelers and Cowboys for the most Super Bowl appearances with eight. 10. Before the Broncos hired Gary Kubiak in 2015, they were coached by John Fox, who took them to Super Bowl XLVIII. Before the Panthers hired Ron Rivera in 2011, they were coached by John Fox, who took them to Super Bowl XXXVIII. 11. Fox is the winningest head coach in Panthers franchise history with 73 victories in nine seasons. Current Panthers head coach Ron Rivera ranks second with 47 wins in five seasons. 12. If Rivera is victorious, he will become only the second Hispanic coach to win a Super Bowl, the first being Tom Flores, who won with the Raiders in Super Bowl XV and Super Bowl XVIII. 13. Super Bowl 50 is the first Super Bowl matchup between quarterbacks who were drafted No. 1 overall. Manning was taken No. 1 in 1998 out of Tennessee, while Newton was taken No. 1 in 2011 out of Auburn. 14. Peyton Manning and Cam Newton have faced off one other time in their careers, with Manning leading the Broncos to a 36–14 win in 2012. 15. Both Manning and Newton have appeared in some awesome television commercials. 16. Manning is 13 years and 48 days older than Newton, which marks the biggest age difference between starting quarterbacks in Super Bowl history. 17. If the Panthers win and Newton is voted the game’s MVP, he will become only the fifth player in history to win the Heisman Trophy and Super Bowl MVP. 18. A Super Bowl victory would tie Newton with Joe Namath and Joe Montana as the only starting quarterbacks to win both a collegiate national title and a Super Bowl. 19. Newton is the first quarterback to be asked to dab at Super Bowl Media Day. He also freestyle rapped on Monday. 20. However, Newton isn’t the only Super Bowl competitor known to dance. Check out Von Miller’s dancing, one of the many interesting facts about the Broncos linebacker. 21. This year’s Super Bowl marks the third straight year that both top seeds are playing. 22. The head referee for Super Bowl 50 will be Clete Blakeman, who officiated the divisional playoff game between the Packers and Cardinals that featured an overtime coin toss malfunction. 23. 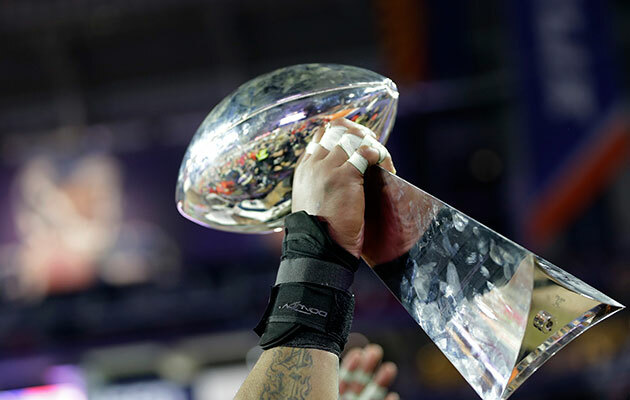 For the first time, the Super Bowl is not using roman numerals. The league said the next Super Bowl will go back to roman numerals. 24. Coldplay will preform at the halftime show, with a guest appearance by Beyonce, who headlined Super Bowl XLVII in 2013. 25. There is speculation that this could be Peyton Manning’s final NFL game. He reportedly told friends he plans to retire. At Super Bowl Media Day, Manning declined to say if it would be his last game. 26. The Panthers are favored to win the game, which is expected to draw as much as $4.2 billion in wagers, with $4.1 billion in illegally-placed bets, according to the American Gambling Association. 27. There are three Super Bowl players who haven’t played a snap in 2015: Broncos O-lineman Robert Myers Jr., Broncos cornerback Taurean Nixon and Panthers defensive back Lou Young. 28. The Broncos have 18 players who were on a Super Bowl roster, while Carolina only has seven players. 29. Manning is the first quarterback in NFL history to take multiple teams to multiple Super Bowls. 30. CBS will capture Super Bowl 50 using 70 cameras. 31. Manning's two Super Bowl losses came against quarterbacks making their debut in the game (XLIV against Drew Brees and XLVIII against Russell Wilson). Quarterbacks making their Super Bowl debut, like Newton, have won four straight over quarterbacks with previous Super Bowl experience. 32. Broncos offensive lineman Evan Mathis is the only active player in Super Bowl 50 to have played for the Broncos and Panthers. 33. Carolina Panthers offensive coordinator Mike Shula is the son of Hall of Fame coach Don Shula. Don said he plans to be in attendance for the Super Bowl. Mike was seven when he watched his dad's Dolphins beat the Washington Redskins in the Super Bowl to finish the 1972 season 17–0. 34. Newton will be the sixth black quarterback to start in a Super Bowl. 35. The Broncos, who are the designated home team, decided that they will wear white uniforms for Super Bowl 50. They wore orange in Super Bowl XLVIII. 36. Manning will earn $2 million because the Broncos made the Super Bowl. The quarterback negotiated the bonus into his contract when he restructured his deal ahead of the 2015 season. He made $15 million in base salary for the regular season and can earn another $2 million with a win in the Super Bowl. 37. In the Broncos' last Super Bowl appearance, they allowed the first 36 points of the game, the most ever allowed to start a Super Bowl. 38. Which college is represented the most in Super Bowl 50? The SEC leads all conferences with 22 former players on the Super Bowl rosters, but Ohio State has the most players with five. ​40. A loss for Manning would make him the fourth quarterback in NFL history to lose three Super Bowls. He would join John Elway, Jim Kelly and Fran Tarkenton. 41. Back to the queen: Beyonce will become the first female to perform in two Super Bowl halftime shows. 42. Carolina has scored an average of 36 points in its last nine games. The Panthers' 31.3-point scoring average this year is a franchise record. 43. In case you cared, Donald Trump is rooting for the Broncos. 44. The Panthers are traveling 2,680 miles to get to the Super Bowl from Charlotte. The Broncos have to travel 1,279 miles from Denver. 45. 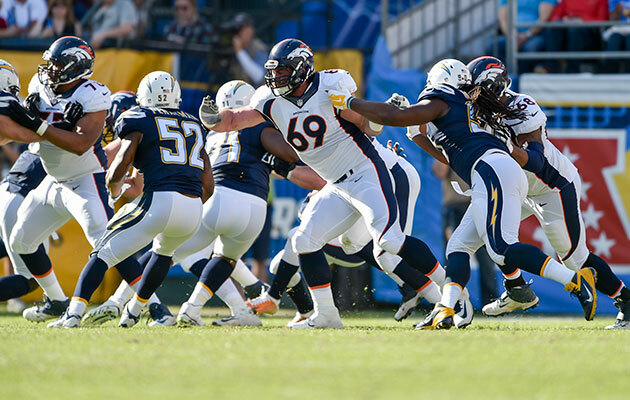 The Broncos led the league in sacks this season with 52. 46. The average temperature in Santa Clara on Feb. 7 is a high of 61 degrees (Fahrenheit) and a low of 44. 47. Rivera won the Super Bowl when he was a linebacker with the 1985 Bears. 48. Peyton Manning needs 140 passing yards to become the sixth quarterback ever with at least 1,000 career passing yards in the Super Bowl. Others who have accomplished the feat: Terry Bradshaw, John Elway, Joe Montana, Kurt Warner and Tom Brady. 49. The Broncos were involved in a minor bus accident on Monday. 50. At Super Bowl Media Day, Manning told reporters that Newton should be the league’s MVP.